Torpedoed! The RMS Leinster Disaster by Philip Lecane, 2005. Has list of passengers. age 7 when father died. 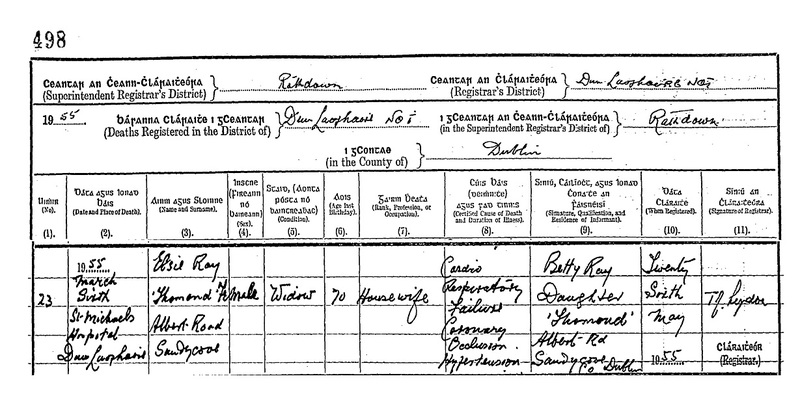 In [Census, 31 Mar 1901] he is listed as age 16, staying with his uncle Frank's family in Ennis, Co.Clare. Listed as living Dartmouth Square, Ranelagh (nr Leeson St), Dublin, at marriage, listed as "gentleman" (no occupation). He mar 20 July 1910, Dalkey RC church, Co.Dublin [GROI] to Elsie Ward [Elizabeth, born 1884, Co.Meath, dau of John Ward]. She was living Dalkey at mar. They are listed in [Census, 1911] as living 59 Dartmouth Square, Ranelagh. He is "Manager, Bacon Factory". Living 19 Northbrook Rd, Dublin, at son's birth 1912. He is "merchant". They were living 12 Healthfield Rd, Terenure, Co.Dublin, as at 1914. [PAT/1, p.8] said: "He lived in Dublin and had a youthful appearance and manner. He made and lost money as though he were throwing at hazard. Life was brimful of the unexpected for him and he had friends everywhere". "And the Rays are going broke!" was the phrase in the O'Mara family. [PAT/1, p.8] said that Elsie "could take the ball of life as it bounced for Cousin Lad; up and down; down and up; hostess or housewife; she was equal to it either way". "When they were rich they raced and dined and had a tremendous time. When they had less money all the sterling qualities of my cousin Elsie became apparent." 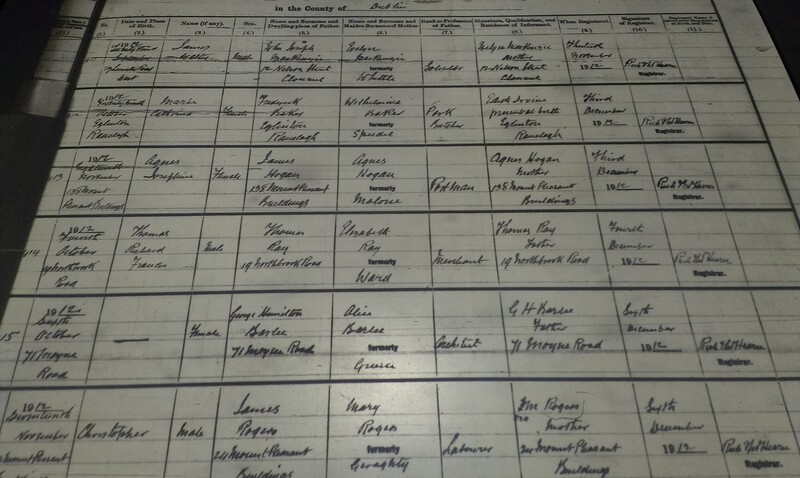 Elsie's family was in wine trade, publicans. They constantly inherited money. Always going broke, but some relative on her side would die and they'd come into money. Two aunts are meant to have died on the RMS Leinster, which was torpedoed by the Germans just outside Dublin Bay in WWI, 10 Oct 1918. See casualty list. Note among the dead was one Maud Elizabeth Ward (born 12 June 1874), secretary to Douglas Proby (who had seats in Cambridgeshire and in Co.Wicklow). Lad Ray was a racehorse owner and trainer. His obituary describes him as "a well-known owner of horses, who was a regular patron of Irish race meetings". He trained his own horses and the horses of others. Won many races. Horses he owned included "Odd Cat", "Parteen", "Roda" and "Clonlara". He was also a boxing promoter. He was one of the promoters of the dramatic world light-heavyweight title fight between world champion Battling Siki (one of the first world-famous black boxers) and Co.Clare boxer Mike McTigue at the La Scala Theatre, Dublin, 17 Mar 1923 (just after independence, while the Civil War was still on). McTigue won and became world champion. Lad and Elsie lived Annfield, or Annefield, Clonsilla, Co.Dublin (think there were stables there). Finally Lad and Elsie did go bust. Had to go live in flat, Merrion Rd, Dublin. Things were very hard, children just growing up. Then think some aunt died, got enough to get going. But then Lad died, Elsie left to bring up family on her own. At Lad's death 1931 he is listed as "horse trainer", formerly of Annfield, or Annefield, Clonsilla, now of 74 Merrion Rd. Lad died Fri 11 Sept 1931, St.Vincent's Hospital, Dublin, of tuberculosis, age 47 yrs [GROI]. See death notice, Irish Times, September 12, 1931. See death notice, Irish Independent, Saturday, September 12, 1931. See obituary, Irish Times, September 14, 1931. Funeral Mon 14 Sept, bur Glasnevin Cemetery. See funeral report, Irish Times, September 15, 1931. See photo, Irish Independent, Wednesday, September 16, 1931. Elsie would be "Mrs. T. Ray" at funeral of Bride Power 1935. She would be "Mrs. E. Ray" at funeral of Joe O'Mara who died 1950. 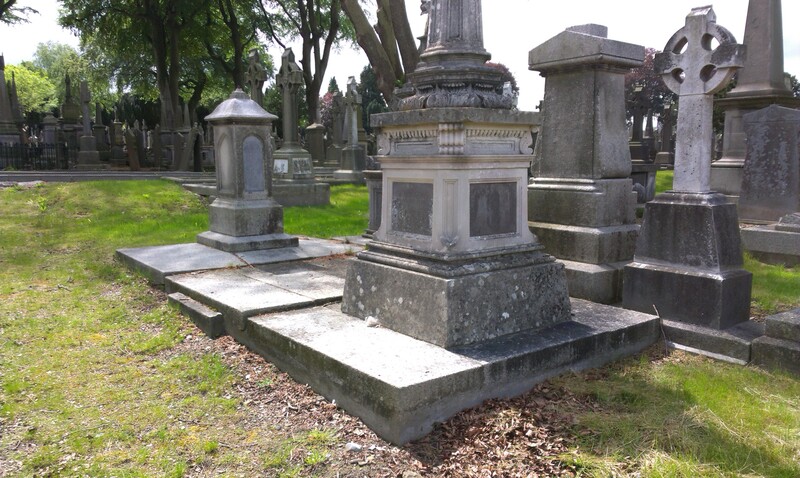 She would be Elsie Ray, widow, of "Thomond", Albert Rd, Sandycove, Co.Dublin, who died 6 Mar 1955 at St.Michael's Hospital, Dun Laoghaire, age 70 (born 1885). See death in [GROI]. Death registered by dau Betty Ray, of "Thomond", Albert Rd. Anne Marie Ray, mar John Bird. James Ray, mar and had issue. 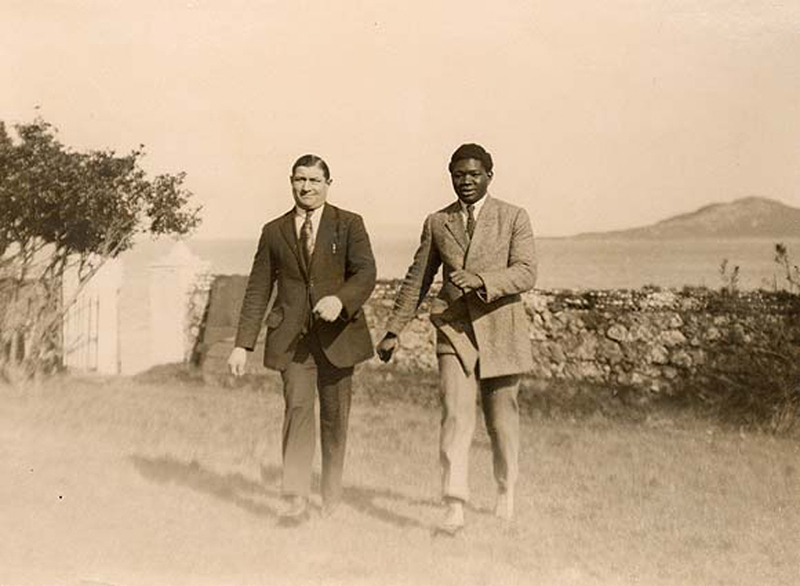 Battling Siki (with his sparring partner Eugene Stuber) in Dublin for the fight, Mar 1923. The boxing match in Paris, 24 Sept 1922, when Battling Siki became world light-heavyweight champion. Battling Siki lost the title on 17 Mar 1923 to Mike McTigue in the Dublin fight that Lad Ray was one of the promoters of. Thomas "Lad" Ray was buried 1931 in Glasnevin Cemetery, Dublin. Location: mA 52, Section: CHAPEL CIRCLE. 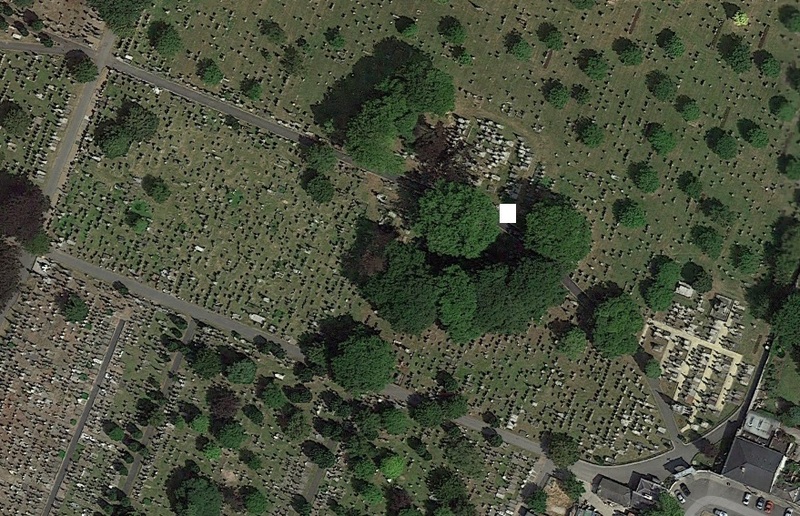 The burial place of Lad Ray is in the open area to the left here. It is either the raised area at the path, or the small patch just the far side of the path. Either way, there is no headstone. 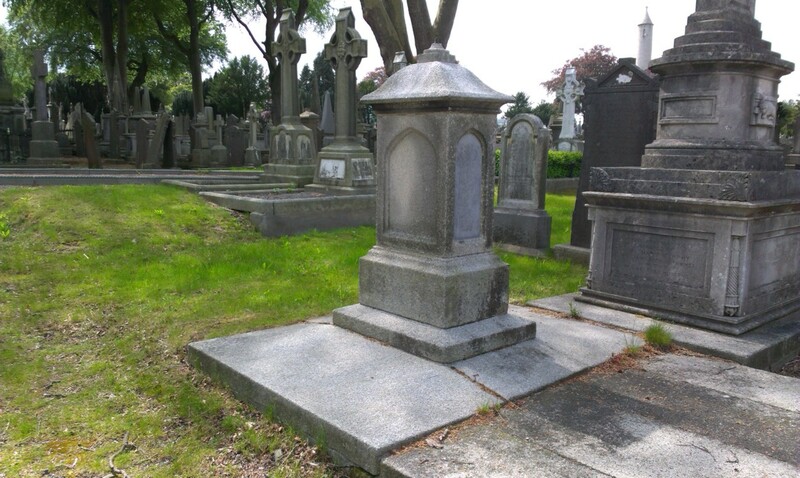 The grave in centre foreground belongs to Fitzgerald (see diagram below). Photo 2014. See full size. See wider shot. View of the mA row of graves. "mA" is the row going left-to-right. The numbers are increasing as you go right. The Lad Ray grave is mA 52. So that would be right beside the path on either the left of the path or on its right. Image from street view. Click through to rotate. Location on satellite view (white square).